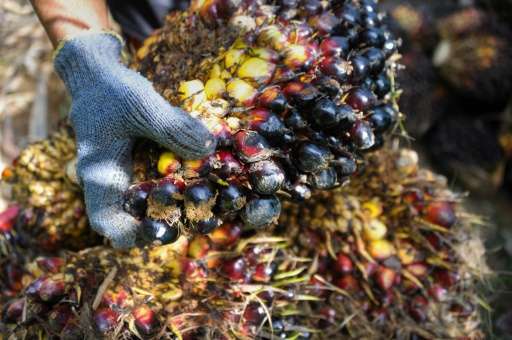 Palm oil produced on tropical plantations that drive deforestation has become a major biofuel for vehicles in the European Union, industry figures released Tuesday by an environmental group revealed. Recent research, however, has shown that the climate impact of so-called "first generation" biofuels—mainly rapeseed, palm, sunflower and soy oil—is in fact greater than for fossil fuels, once deforestation is taken into account. Recognising that the continued use of these crops clash with goals for slashing greenhouse gas emissions, The EU last year imposed a cap—seven percent—on the biofuels produced from food crops. A Fediol staff member said director general Nathalie Lecocq was not available to comment, and an email sent to the industry group was not answered. Clear-cutting and burning to make way for palm oil plantations also cause health-wrecking pollution and destroy some of the planet's richest "hotspots" for biodiversity. It would be so much smarter to do something like this - http://greenwave.org/ The political decision making is so insane. Oh right! So you are saying that the governments made this up all on their own and that there were no research papers which touted the greenness palm oil derived fuels and their carbon benefits. Next you will be claiming that corn ethanol is a boon to green energy..
"Produced mostly in Malaysia and Indonesia, palm oil causes three times more greenhouse gas emissions per unit of energy than diesel fuel, according to a recent analysis"
If this is even true , it does not need to be. When the forest is cleared the valuable timber should have been put to other uses. The palm trees probably then will contain about as much carbon as the original forest. The palms can then be cropped each year to produce the oil. One complaint is that these are single species plantations which are bad for wild life. By mixing in various other crops , such as bananas will help. Remember once the plantations are sustainable, the oil produced should be nearly carbon neutral whilst the oil from the ground is 100% not. I agree discretion should be used in choosing plantation locations to preserve old forests and their wildlife. Using palm oil for fuel is stupid, absolutely stupid. the palm trees probably then will contain about as much carbon as the original forest. Tropical forests are a carbon sink because they grow fast enough that they physically bury decomposing plant matter into the ground. They form a kind of peat. When such forests are cleared and planted with palm trees, the carbon sequestering action stops. 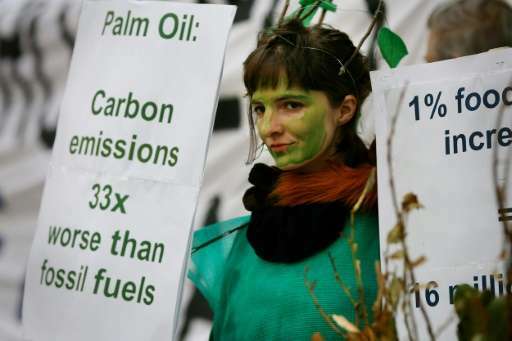 When can I expect proof that "there were ['no' removed] research papers which touted the greenness palm oil derived fuels and their carbon benefits" ? uhm... how is GO's posting of a "3D ocean column farming" link somehow indicative of "gov't made this up" and "there are no research papers"?? ... but if that isn't enough, how about those cig's? To be fair, organizations like WWF supported "sustainable palm oil" as a next generation biofuel and still do. Trouble was that "sustainable" was thrown out the window the moment anyone started paying any money for it, and that's a kind of common problem with biofuels and renewable energy in general. People like it and it's all well and good as long as it stays small and harmless - and consequentially completely irrelevant - but the moment it starts to scale up to something that makes a difference, it starts to make the wrong sort of difference and people start to object to it. Things like; wind turbines are fine. Millions of wind turbines are not fine, because each turbine needs neodymium, which is a rare earth metal, which is found in deposits next to uranium and thorium, which end up being piled into literal mountains of radioactive waste all around the world to satisfy the demand for clean energy. There is, in fact, a close relationship between thorium and rare earths; they often come together. In fact, monazite, was first mined to produce thorium and rather than rare earths. After representing the major source for the world's rare earth supply, nobody wanted to deal with monazite any longer, wondering what to do with the residual thorium. this is where and when China sneaks past the 'Western" standards to begin its rare earths market dominance. China stepped in and took advantage, deciding that it would dominate the rare earth industry, which was understood to be critically important. Western companies that had mined monazite until that point, decided to abandon the industry. Mines were shut down simply for having thorium discharges in the tailings under pressure from environmental agencies and groups. The above is a perfect example of the do-gooders causing more trouble than they're worth. Environmentalists in the west protest against polluting REE mining, which causes the mining companies to close doors and shift production to China, which causes unemployment and economic woes, and the resulting social troubles and expenses which in part hamper the efforts to actually clean up the western energy infrastructure. This however allows environmentalists in the west to believe that renewable technologies that absolute depend on a massive supply of REEs are cleaner and safer than things like, say, nuclear energy, because the actual waste is now someone else's problem: out of sight, out of mind. The average environmentally concerned person from a middle class family doesn't feel the social issues personally, or can't make the cognitive leap from banning industry to losing jobs, so that's not a "real issue" to them either. The same issue is present with the EU 10% biofuel mandate. When you tell the industry to do something they don't want to do, because it isn't economically sensible, they'll find the cheapest way to do it to minimise the loss - not out of malice but because it's possible. Individual people might be self-sacrificing saints - whole populations follow the path of least resistance. So when you artifically create a demand for a thing like biodiesel, it's going to get produced the easiest cheapest way possible, and that's going to be done regardless of the environment. If it takes any extra effort to do it in a "sustainable" fashion, it's going to get done unsustainably, and you're going to end up playing world police in preventing that.